The first commandment that was given to us is the commandment of fear. This means fearing whether I am advancing down the spiritual path, whether I am acquiring the spiritual world, whether I understand what I read the right way, and whether I really act in the group. In short: Will I succeed? I have to be consumed with this worry all the time. If I relax, then I immediately get off the track leading to the goal. In our world, psychology enumerates over 800 kinds of fear. Do I earn enough? Am I healthy? Will something bad happen to me? However, in Kabbalah, we are not talking about derived fears, but the primordial fear: Am I going toward the goal? Will I be able to bestow? This is already worry for something for which I don’t feel the slightest need. This is simply an outrage from the perspective of egoism. It’s completely unnatural. Therefore, we are yet to go through a big process of building the necessary conditions. However, in reality it is possible to actualize it simply. In this regard everything depends on the extent of the efforts we make. First of all, I have to really be scared for my spiritual path. “Am I advancing toward the goal correctly?” Secondly, only once I acquire fear does the quality of love come to me because there is no love without fear. Question: If the world was ruled by women, would it be better? Answer: The world cannot be ruled by women. By nature a woman has to be in the possession of her father or husband. That’s because according to her spiritual root, she is Malchut, which can only act by virtue of what her husband gives her. She does not have anything of her own. That is a woman’s role: By inspiring a man to do spiritual work, she receives Light from him. We have to understand that there is nothing belittling about this. A woman is not lower than a man, but on the contrary, without her desire, the world would stop moving forward. There would be no correction and we would not attain unity with the Creator. We unite with Him precisely by virtue of the female desire. That is how we realize the male force. We shouldn’t look at the differences or search for the advantages one has over the other. We shouldn’t judge it egoistically. On the contrary, our approach should be altruistic: How to connect men and women in order to reach the goal. After all, the goal cannot be reached without perfect unity between them. When each one bestows to the maximum, then they are both equal. If a woman gives all of herself and a man gives all of himself, that means equality reigns between them and they advance toward the Creator. But does each of them do the same thing? Of course not. Opposite things come from them, but that means they are equal. It’s a different matter in our world where both men and women are presented with the same demands. Is such a thing possible? This problem is yet to be expressed through a very powerful cataclysm because we thereby destroy the foundation of our being. “Introduction of The Book of Zohar,” Article “Yitro (Jethro),” Item 194: When this one speaks, he stretches the skin of his forehead and those lines are not very visible. He bends his head and walks. His right serves as left, and his left serves as right. He is always sad, gossips, considers himself smart in all his actions, and hateful toward those who engage in Torah. However, if I begin to build relations with the environment, with my friends, in order to position myself under their influence and to reveal the Creator within the connection between us, then the place of our connection is called Shechina. This is where the Creator becomes revealed. A “human” within me is my attitude toward my friends, which I awaken within myself in order to build this place of revelation of the Creator. Therefore, everyone by himself is not a “human” because to be a “human” means to be “similar to the Creator” in relation to other people, in bestowal and love. In Hebrew the word man (Adam) comes from the word similar (Domeh). The Zohar speaks precisely about these forms of a “human,” the kinds of connection between us, meaning about the Partzuf (structure) of the soul. This Partzuf contains all forms (forces) described above: arms, legs, faces, and so on. 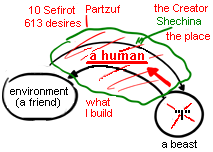 These are the ten Sefirot with the 613 desires which we have to correct from egoistic into kind relations between us. Therefore, when The Zohar is telling about people with certain face features, hair color, palm lines, and other characteristics, it speaks about the connection of each one of us with others, about the types of this connection based on the soul’s type, about the properties of a “human” within us. During the first stage we correct our egoistic desire in the zero, first, and second degrees of Aviut, and during the second stage we correct it in the third and fourth degrees of Aviut. The lower part is Galgalta ve Eynaim (GE), the upper part is AHP. And together it is the vessel of a soul. Trepidation means that there is one main worry behind thousands of concerns: Whether I will be able to not receive? As a guest, I worry about managing not wanting to receive the host’s treats. He tries to persuade me, but I refuse over and over again. In other words, time after time, I acquire the screen to an increasing Aviut of desire until I rise above my entire Aviut (which is called Mount Sinai) and acquire the quality of trepidation. Now I rise over all the receiving desires and become ensured against receiving egoistic pleasure. Then I begin to become mutually included with another: “What does he want?” I see what he wants as well as the degree of my ability to do something for him. I acquire his desires, his Kelim, and I provide for him in my Kelim. Now I act the other way around: I reverse my Kli in order to receive for my neighbor. A mother takes care of her children in the same way: She does everything to fulfill them. This is how her love manifests. Hence, love is about me never taking anything from others, never stealing, or hurting others. This pertains to the previous stage, trepidation, the first stage of the correction of Kelim. And then comes love’s turn which Rabbi Akiva referred to as the general rule of the Torah: “Love thy neighbor as thyself.” This means that you take the desires of others and unite with them in order to fulfill them. This way, love, in its true spiritual sense, cannot be reached without a considerable preparation. Suppose I get sick and am going to see a doctor, but while doing so, I don’t just tend to my animate body; rather, I think about how I add everything to this one force. After all, the physician, the medicine, and I are all parts of the integral system. The doctor is managed by the Creator, and the medicine was discovered because of Him. In other words, I must connect everything that seems to me as existing separately from each: the doctor, the medicine, my sickness, and myself to a singular source. And later on when I recover, I must say that all of it from the start was unified. The Creator simply turned the circumstances so that I would unify them within myself and see His oneness. Add The Creator To The Group! Question: It is very easy for us to unite during the convention because it seems to be very natural here to cancel ourselves, to “lose our heads,” to try to connect with others, and include ourselves in them. But it is very difficult to do this in your own group, once you return from the convention. Many problems arise and it becomes very difficult to feel the inner essence of the group; everything suddenly disappears. How do you overcome this? Answer: Let us do an exercise: Let us come to a group, sit in a circle, look at one another, and think: “What is the Creator doing with us?” We want to unite, we work in the group, we have opened up a center of Kabbalah, we have gathered together, prepared a place for meeting, and nobody wants to go there…. Look what He does! We are not to blame for this; we do not have freedom of will. Look how He awakens us! What does He do this for? Why does He need it? What does He gain from this? The only reason you do not advance is because you forget about one more component that exists among you: the Upper Force, the Creator, who arranges and prepares everything. Add Him! Become partners with Him! And then you will understand what you need to do, how to advance being connected with one another and with Him. Add Him to your group. I am serious about this: He exists among you. Start having this kind of gatherings of friends, these discussions of what happens between you, and then everything will clear up. In this world I constantly tailor myself to the standards that the society imposes upon me by convincing me to buy or do something, while in the spiritual world I need to draw an example from the Creator. However, the problem is that if He were to reveal Himself, we would fall completely under His influence and would become a million times more dependent on Him than we depend upon the environment today. We would become absolute slaves, like the still, vegetative, and animate forms of life, which do what nature commands them to do and fully follow their instincts. And then we would not even feel like we live an independent life. But the Creator, this general force of nature of creation, wants us to be independent and equal to Him, instead of following His orders like a robot. There would be no point in creating the creature which automatically follows its nature’s orders, and where the entire outcome is clear from the beginning. The Creator’s plan was to create man free so that man himself would choose to rise to the level of the Creator, to learn about his Creator, and want to become just like Him! Just like any person in this world wants to be loved for who he is, the Creator also wants us to become acquainted with Him, attain Him, and see that His state, quality, and force is the ultimate perfection. Thus, He cannot reveal Himself to us so that we will not become His slaves and automatically follow His orders. He plants in us the desire to develop and strive towards Him, but He conceals Himself. So how can we become like Him in this case? He comes up with a simple solution. He creates the creature called Adam (man), a spiritual force, a quality similar to His, and breaks this creature into a billion pieces! And now the created being itself, and not the Creator, must put together an environment for itself like from pieces of interconnecting blocks. This environment has to mirror the creature’s image of the Creator, its knowledge of Him. Man advances and builds his own environment to influence him in the opposite direction and develop him. It follows that we build our own Creator, and this is why He is called “Boreh,” meaning “come and see.” We build our environment and in this way we build ourselves. I am not able to create myself or influence myself. I am a finished product of my environment. But by constantly building my environment, a shell to influence me, I indirectly influence myself. It turns out that I build a system for my own education. Then I am somewhat separate from the Creator, and I freely build myself by creating my own environment in accordance with the values that I want to instill in myself. I am not able to change myself, but I can artificially build a society to convince me of the values with which I now disagree. This society will convince me that I need to strive towards bestowal. And since I have built this society myself, it is as if I had built myself. In other words, I constantly build the Creator’s image within me, and thus I advance to the point when these three forms: I, the environment, and the Creator draw so close that we become as one whole. This really is free development because I do everything myself, I constantly think and decide on the ways to advance. I examine the world that now becomes revealed before me, and I test myself for ways to properly advance.